In early the 1970’s, when I was just 13 or so, Cryptocaryon irritans (“marine ich”) and Amyloodiniumocellatum (“marine velvet”) were a bit less of a problem for my fish than they are now when I quarantine new fish as an aquarium curator. The reason was a product called Marex from the Aquatronics Corporation (they have long ceased operations). Marex was sort of a wonder drug for us back then – simply adding a single $1.99 dose protected the fish in a 50 gallon aquarium from many diseases plus it killed the unsightly algae that grew all over the tank decorations back in those days! When the company went out of business I moved on to using other products. 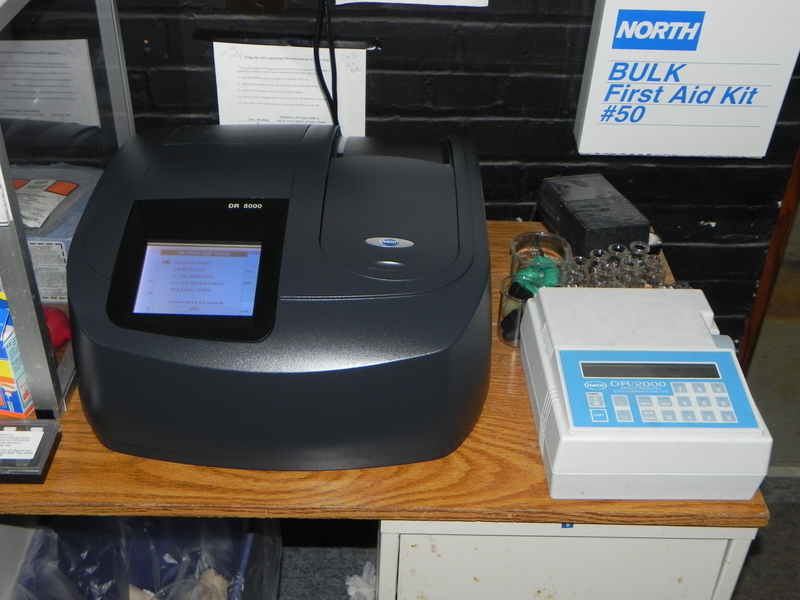 For the past 25 years, I’ve been using ionic copper measured with a spectrophotometer twice a day to control marine ich and other protozoan diseases. Copper is slow to affect a cure, and the difference between a therapeutic dose and a dose harmful to some fish species is slight. Still, it seemed to be the best method for quarantining or treating active diseases in fish. Thinking back to when I was a youngster, I did some research and discovered that the active ingredient in Marex was chloroquine, and I was familiar with that drug as it was being used by other public aquariums. Acquiring some myself five years ago, I’ve begun incorporating it into my arsenal of aquarium fish disease treatments. A few home aquarists have begun re-exploring its uses as well, often calling it by the shorthand name of “CP” which stands for chloroquine phosphate. This article provides those aquarists with additional background information to enable them to be better able to use this “new” drug if they wish – having options is always a good. Chloroquine was developed for human medicine in the 1930’s at Bayer laboratories. It was first thought to be too toxic for any practical use, but decades later, it was shown in clinical trials to have significant value as an anti-malarial drug. However, its subsequent wide-spread use allowed the malaria disease organism to become resistant to it, requiring the development of other treatments. English pronunciation of the compound varies between “KLOR-oh-kwin” and “Klor-oh-KWEEN”, with the former used by most aquarists, while the latter is listed on some word pronunciation web sites. Chloroquine is typically dosed at a rate of 10 to 20 milligrams per liter (mg/l), with 15 mg/l being considered a “standard dose” (Hemdal 2006). Note: in most instances, solutions measured in “milligrams per liter” are equivalent to “parts per million” or ppm. Measure (in inches) the length, width and height of the water inside the aquarium from the top of the gravel layer to the water’s surface, and inside the glass front to back and side to side. Multiple these three numbers to get the gross volume in cubic inches and then divide by 231 to determine the volume in gallons (there are 231 cubic inches in a US gallon). In an effort to isolate the drug from sensitive invertebrates, some aquarists have administered the drug orally to their fish. Chloroquine is very bitter, and if the drug isn’t masked by strong flavors in the food used to bind it with, fish will soon learn to avoid it. In addition, for oral medications to work, the fish still needs to be feeding normally, and acutely ill fish often refuse to feed. Finally, dosage is very difficult to control in oral medication for aquarium fishes. The drug must be mixed into a gelatin food binder at 6 to 10 milligrams of drug per gram of food, and then that has to be fed to the fish at a rate of around 3% of its body weight per day – and few, if any aquarists know the actual weight of their fishes. Activated carbon has been widely reported to remove chloroquine from aquarium water at the conclusion of a treatment, but be aware that carbon has been implicated in the development of head and lateral line erosion in marine surgeonfish (Hemdal & Odum 2011). If you do decide to use carbon to remove chloroquine, it would be advisable to use a premium pelleted carbon, rinse it well with deionized water prior to use, and remove all of the carbon when finished. The amount of carbon needed to remove all of the chloroquine will be a guess. A starting point would be 4 to 6 grams of well-rinsed carbon per gallon of aquarium water, placed in a fine mesh bag and added to the aquarium’s power filter for 48 hours. If the aquarium will be using delicate invertebrates at the conclusion of the treatment, it would be more prudent to change all of the water first. 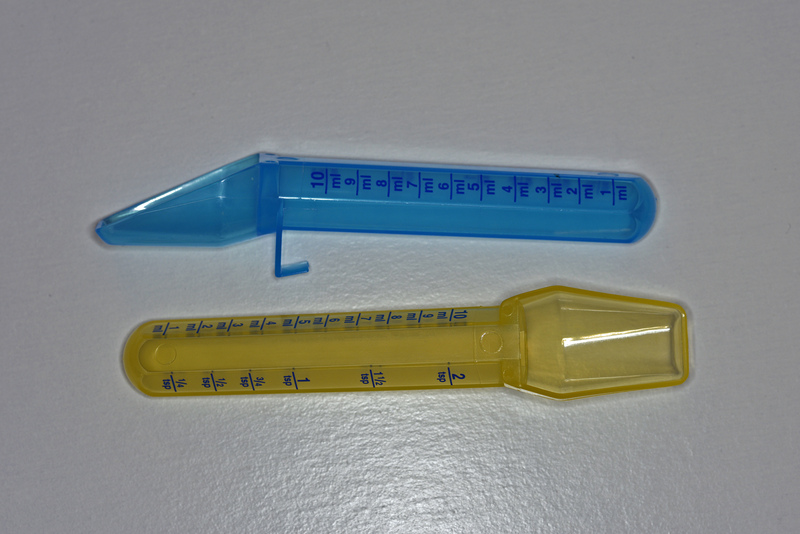 In one test attempting to measure the ability of carbon to remove chloroquine, a spiked sample actually showed an increase in absorbance at 329 nm after filtering through carbon for 24 hours. Since the chloroquine level couldn’t have risen, it is presumed that something in the carbon dissolved into the water and that obscured the reading. However, this also made it impossible to determine if the carbon actually removed any of the chloroquine, so this aspect remains open to questioning. In a second test, 20 mg of chloroquine was dissolved in a liter of distilled water. This sample was then exposed to 4 g of rinsed activated carbon for a week. Measured at 329 nm, the sample only dropped by a calculated 5 mg/l chloroquine according to the standard curve. 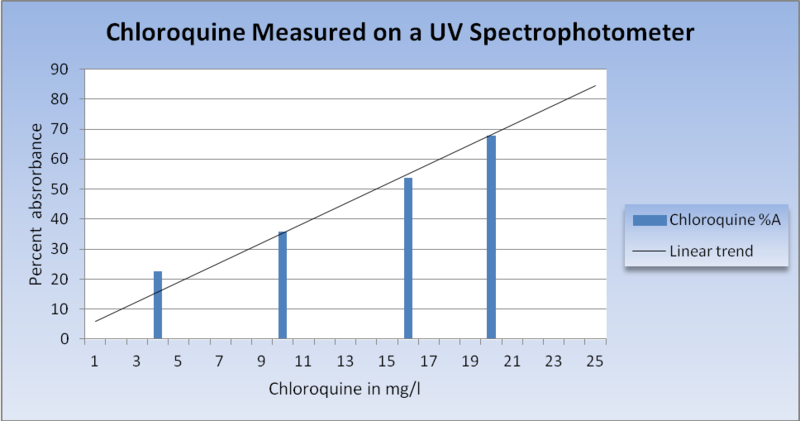 Since something in the carbon seems to be obscuring any chloroquine measurements, it is difficult to understand how any of the reports that carbon removes chloroquine could have been substantiated, at least by using a UV spectrophotometer. Two very basic qualitative in vitro tests were conducted to test the efficacy of chloroquine phosphate as a potential treatment against the ciliate Uronema marinum (Hemdal 2010). Uronema is a fairly common ciliate that is difficult to treat as these parasites can burrow into the fish’s skin and therefore isolate themselves from many external bath treatments such as formalin, copper and hyposalinity. These informal tests show that this drug is effective at killing Uronema when it is used as a bath, but it is unknown if enough of the drug would taken up by the fish in order to raise the level in the blood to therapeutic levels. 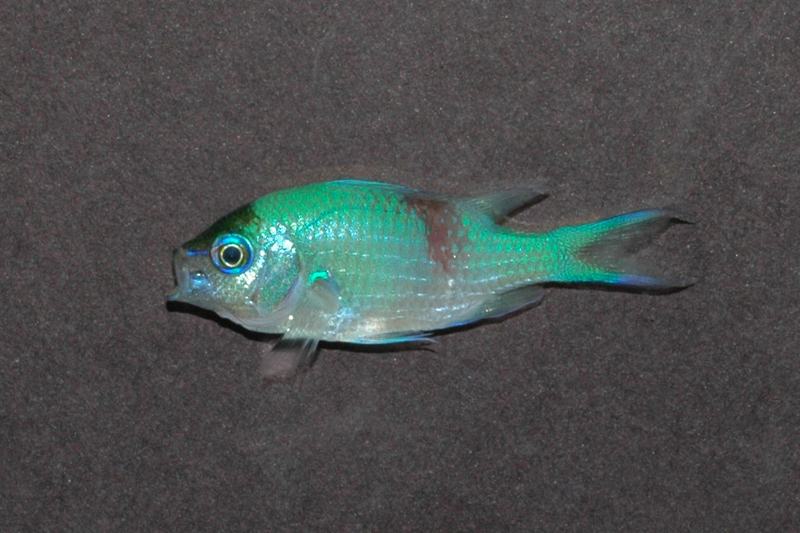 In a second test, the bodies of two green chromis that had died from acute Uronema infections were exposed to chloroquine at 35 mg/l. A marked reduction of the numbers of the ciliate was seen within three hours, and only one surviving Uronema was seen on the body of one of the fish after eight hours. Using deceased fish for these bio-assays is problematic in that there is difficulty obtaining specimens “as-needed” and room temperature tests longer than 24 hours cannot be performed as the fish flesh begins to putrefy. The current major drawback to using chloroquine to treat fish diseases is locating a commercial source of the drug. Public aquariums, buying large quantities, have no difficulty in acquiring it from online companies at around $185 per kilogram. Hobbyists, needing much less of the drug, have not been able to find it easily available in lesser amounts – but that should be changing, now that its use has become more popular again. Until an aquarium manufacturer starts marketing it again, you may be able to acquire it from your veterinarian, or perhaps go in for a “group buy” with other hobbyists. Recent online prices for non-prescription chloroquine vary depending on the amount purchased from .185 cents per gram up to $2.40 per gram. One gram of chloroquine will dose 18 gallons of water at 15 mg/l.